Ridley Scott's long-awaited science-fiction film Prometheus has crash-landed. Prometheus was initially intended as a direct prequel to Alien, but has been set apart as a stand-alone work within the Alien universe. This sudden change in direction suggests that there may have been some serious problems during filming, something that Scott may have done in an attempt to salvage Prometheus and its crew from the fire. Prometheus was the Titan who served the gods and stole fire only to bestow the gift on mankind. It's also the name of the spacecraft on a deep space mission to study alien life forms and unlock the mysteries of the Universe. The story line is cliched. What starts like a Douglas Hill novel in the realm of the Colsec Rebellion turns into something of a comedy not unlike the plot for Leslie Nielsen's space spoof, The Creature Wasn't Nice a.k.a. Naked Space. Prometheus is basically a deep space version of Sphere, the deep sea science-fiction thriller starring Dustin Hoffman, Samuel L. Jackson and Sharon Stone. Both films detail a voyage of discovery into the darkest depths of the unknown, have a star-studded cast and deal with mysterious extra-terrestrial matters and the essence of man. However, instead of improving on Barry Levinson's psychological thriller... Ridley Scott has simply molded it to fit into the world of Alien. Noomi Rapace, Michael Fassbender, Charlize Theron, Idris Elba, Guy Pearce and newcomer Logan Marshall-Green headline the team of scientists and spaceship crew. The casting decision behind The Girl with the Dragon Tattoo's Noomi Rapace must have been an attempt to capture the essence and strengths of Sigourney Weaver, who made Alien's protagonist so dark, provocative and intriguing. The only problem is that Rapace is Swedish, which may have proved difficult for Scott and even the on-board dialect coach. The real star of Prometheus is Michael Fassbender, who plays "David"... a cybernetic humanoid robot with influences as far afield as Spock from Star Trek, C-3PO from Star Wars, Niles from Frasier and The Pet Shop Boys. Fassbender's voice, grooming and mannerisms play into this notion and his restrained, emotionless performance is quietly powerful and deadly sinister as the "servant" and adopted son takes matters into his own hands. Charlize Theron's presence is welcome and she gives the already stellar name cast a huge boost in terms of credibility. She too has a very particular role, one which Scott has tried to steep in mystery, giving her character a raw enigma and what one can only assume are ulterior motives. However, the Elvish role seems superfluous for Theron, who usually goes for parts with greater depth, emotional involvement and screen time. The rest of the ensemble comprises of Idris Elba, whose cigar-toting role as the rogue, unconventional Captain could very well be inspired by Hannibal Smith and B.A. Baracus from The A-Team. Guy Pearce starred in one of the viral videos to hit YouTube and reprises his role as Peter Weyland, introduced like Dr. Evil and plagued by dodgy make up artistry. While the new kid on the block is Logan Marshall-Green who makes a good counterpart for Rapace. Prometheus struggles with consistency. The film's tonal shifts create a strange concoction of genres. At one point it feels like you're watching a science-fiction take on The Mummy with cheesy tomb raids and alien planet sandstorm action only to find yourself chuckling quietly at unintentional situational comedy on-board the Prometheus spaceship. Another internal issue is that the film begins without acknowledging Rapace as the central character. She's only given the reins halfway through the film, by which stage the audience has been distanced from the hotch-potch of earthling characters. 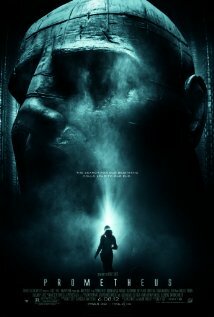 Ridley Scott's film has entertainment value, good pacing and strong production values that will keep you locked in for the ride, but the story seems superficial and is as involving as a monster movie. The sci-fi scenarios are familiar to cliched, while the characters are cold and just out of reach, making Prometheus more about the special effects than the swirling "meaning of life" mystery. There are moments that recall the brilliance of Alien, but Prometheus is damaged goods, glued together by some soul-searching questions that remain unanswered in the hopes of a second shot sequel.